The original Sol Chair is the epitome of a design classic in furniture terms, named after Fiona’s husband it is the perfect representation of male virility. 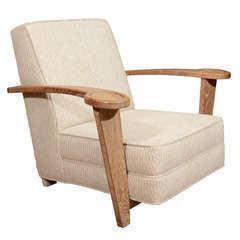 An unique design by Fiona Barratt-Campbell, created in 2006, it is now a classic in the history of modern furniture – the Chair and Stool were originally designed as a modern interpretation of the traditional club chair. With a cast bronze/aluminium or timber frame, the strong geometric lines and the main upholstered body has been made to maximize the comfort of this beautiful armchair. There are a number of variations to the Sol Chair design, bespoke options are also available upon request. Furthermore the Sol chair now comes in two sizes – classic or with larger dimensions. 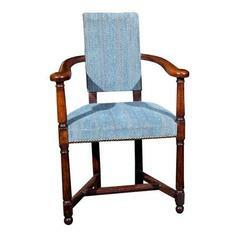 English oak open armchair from the Arts & Crafts period in an early Georgian style. 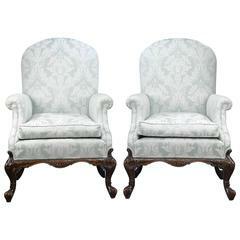 Irish George II carved mahogany Child's armchair with Vitruvian scroll rails, shell carved knees and carved Paw Feet. Newly refinished and reupholstered, an interesting chair with brass spindle accents and unique leg tips. 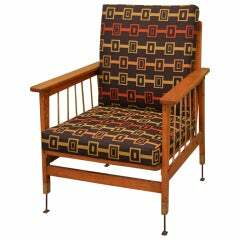 Vintage armchair by Atelier De Coene upholstered in wool/silk with limed oak frame.